After extensive preparations by the ESPRESSO consortium (led by the Astronomical Observatory of the University of Geneva, with the participation of research centers from Italy, Portugal, Spain and Switzerland) and ESO staff, ESO’s Director General Xavier Barcons initiated this historic astronomical observation with the push of a button in the control room. A system of mirrors, prisms and lenses transmits the light from each VLT Unit Telescope to the ESPRESSO spectrograph up to 69 meters away. 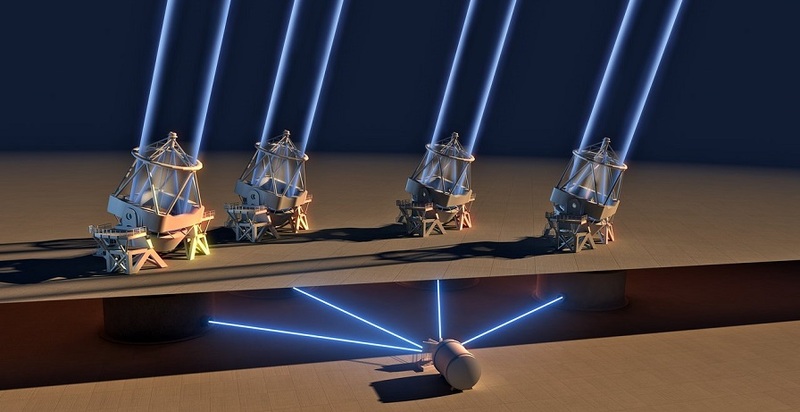 Thanks to these complex optics, ESPRESSO can either collect the light from up to all four Unit Telescopes together, increasing its light-gathering power, or alternatively receive light from any one of the Unit Telescopes independently, allowing for more flexible usage of observing time. ESPRESSO was specially developed to exploit this infrastructure.